I don't know if it was a California scene or a Campania scene, but we were luncho-dining on a deck overlooking the ocean, freshest, juiciest, succulent seafood in our plates, washed down by a glass of Campania's native Falanghina white wine, 70 degrees on a brilliant pre-summer day, not one but two weddings unfolding on the beach underneath, kids running around, couples cozying up, and a country band playing live on the side patio, provoking me to make ridiculous moves. Sam's Chowder House in Half Moon Bay is where it's at! And if you want to chill like the Californitalianos, come for late lunch and stay for early dinner, and bring your every-day bottle of Falanghina, 'cause that every-day wine of Campania, the coastal region at the front of the boot of Italy, is the ideal complement to wash down fresh seafood, whichever part of the world you happen to be in. They've got to have the best Lobster rolls in the country. Rated "top 5 sandwiches in America" by NBC's The Today Show, it's just super fresh soft bread, with butter, and lobster. Sweet, soft, just a touch spongy, but by no means rubbery, like morsels of paradise, they disappear in your mouth before you know it! It seems that every region in Italy has its staple red and white wine. For those next to water, you can be sure, the wine is going to scream seafood. No oak, great acidity, balanced fruit and mineral. These wines don't tend to be great, but for $10-15, they are perfect with crab, shrimp, lobster salads, ceviches, and all kinds of honest-to-goodness fresh seafood cornucopia that we so enjoy here on the Pacific coast! This particular bottle of the 2008 Falanghina from one of the top Campania houses - Feudi di San Gregorio - was consumed in a blink, and beat the pants off the all-too-common Pinot Grigio epidemic that average wine drinkers think is cool. For more info on this wine, check here. Suffice it to say, this vino will not rob your seafood of attention, but it will add its 2 cents worth. And if you ever head to the Bay Area coast, BYOB to Sam's Chowder House on Highway 1 in Half Moon Bay, a place where even a Russian Jew from Ukraine can feel like an Italian in California! Why is Dan the gour-MAN-d? 1. Chopped the herbs from his garden with a professionally sharpened knife. 2. Sautéed garlic in olive oil. 3. Minced boiled potatoes in a potato ricer. 4. Combined with the sautéed garlic. 5. Added 3 table spoons of butta. 6. Added a spoonful of secret concentrated chicken stock. 7. Frothed milk in a cappuccino machine and added to the mash. 8. Mashed into a fluffy heaven. 9. Grilled rib-eye medium-rare, seasoned only with salt-n-peppa, on a mesquite grill. Set aside to rest. 10. Made a secret red wine / beef demi-glace. 11. Sautéed fava beans from his garden, and shitake. 12. Made a salad with broccoli raab greens from his garden as well. 13. Sliced the steak, seasoned/garnished with the chopped herbs. 14. Popped a bottle of Giuseppe Quinterelli Primofiore 2005. 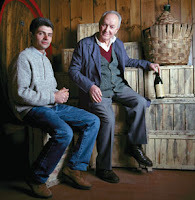 Giuseppe Quintarelli, of course, is the man in Valpolicella, Veneto. His Amarone della Valpolicella sell for stratospheric prices and are the best in the world (Dal Forno is another top producer). The Primofiore (or "First Flower") we had with the rib-eye was his entry-level red made from the first pressings of Corvina, with a small addition of Cabernet Sauvignon and Cabernet Franc. It was not a great wine - it was a real good good good wine. Real wine. Table wine. No pretense. The wine that's there for you with every sip. The wine that has your back. The wine you want to marry, not date. Just pure fruit, balanced by cooling herbs and veggies, reminding of Chinon but with zingy Italian acidity. It was just a perfect match with the steak, the veggies, the sauce! This "value" wine was rated 87pts by Robert Parker's Wine Advocate and 85pts by Wine Spectator - huh! (need I say more about what I think about their ratings?!). Weather in the perfect 70's, blue skies and sunshine. Vines covered in green foliage, coating the Napa valley floor and the hillsides along highway 29. At 11am, Rona, my friend Krishna and I show up at the door-step of estate-like Wilson Daniels building just south of St. Helena for a private tasting of the new releases of the Wilson Daniels portfolio. On the way, we stop by the original Oakville Grocery to grab a croissant and a coffee, bringing back the old memories of when we used to come here almost every single weekend in the days of my Cali passion. The food and setting still beckon me to this day, but alas the wines do not. Lori, the media relations manager at WD, set up this private tasting after we'd met at La Paulee earlier this year. Wilson Daniels Ltd. of course are famous for representing such elevated properties as Domaine de la Romanee Conti, Domaine Leflaive, Domaine Faiveley, and Champagne Salon. Taking a day off work and a 2-hour drive from Palo Alto was well worth it, for the wonderful day that followed was just beginning to unfold. Lori led us to a spotless, antiquish tasting room, beautiful light spilling through the windows onto an expansive table where over 20 bottles had been opened for our inspection, multitude of glasses and a stack of marketing materials neatly placed in front of us. Having just recently enjoyed Domaine Leflaive's 2007 Macon-Verze on 3 separate occasions, I had been looking forward to tasting the 2008 release. Next to it, Lori placed a relatively unknown white Burgundy from Domaine Faiveley - a 2007 Mercurey "Clos Rochette" Monopole, from a vineyard in an unheralded village of Mercurey in Cote Chalonnaise, owned entirely by the Faiveley family. Both Burgundies can be deemed as entry-level wines for the respective producers. Although at that level it's often hard to find compelling examples, these two very different wines both impressed. The 2008 Leflaive was also very different from its 2007 version. I'd found the 2007 to have Champagne-like nose and yeastiness, ripeness and roundness of the fruit, supported by solid acidity and minerality. The 2008 was more Prosecco-like, lean, limey, very mineral, super high acidity, very vibrant, racy, with tons of energy, I could easily imagine bubbles in it. Coming from Maconnaise, area far more southerly than Champagne or Chablis, these wines nonetheless took me north, begging seafood. While I prefer the flavor profile of the 2007 Macon-Verze, for lovers of Chablis, Leflaive's 2008 Macon-Verze provides an excellent alternative. Faiveley's wine from Mercurey was totally different - rounder and more elegant than Macon-Verze, with deft influence of oak (where Leflaive had none), good acidity and minerality, a lovely example of a balanced white Burgundy at the below-Premiere-Cru level. Admittedly I have a bit of a positive bias toward monopoles (vineyards owned by a single domaine, a rarity in Burgundy) - which often provide shining examples of stand-out wines in the vast portfolios of larger Domaines, such as Clos des Ursules from Jadot, Chablis Secher and Beaune Clos des Mouches, both from Drouhin. For me, Faiveley's 2007 Clos Rochette is definitely worth seeking out (at around $30-35 price tag). A mini-vertical of Faiveley's red Burgundy from Nuits-Saint-Georges (village level) - 2004, 2005, 2006, and 2007 - very much followed the classical distinctions of those 4 years. 2004 - aromatic high-acid vegetable; 2005 - balanced and tannic (though Faiveley's 2005 NSG seemed lighter than what I'd expect from that vintage), 2006 - open and generous, fragrant raspberry, great acid, a touch of bitter spice (in a good way), a little mint, and charm - my favorite of the four wines - once again reaffirming to me the pleasures of the under-rated 2006 vintage (in both reds and whites); and 2007 - firm and angular, high-acid (here Faiveley's version seemed more meaty and muscular than I'd expect from 2007 - perhaps even musky, with a touch of milkiness.) Clearly food wines, all with plenty of earth and acid, still I couldn't get overly excited about them. Having previously tasted a good number of Faiveley's Grand Cru level bottlings, my feeling is that the domaine peforms better at that tier of reds. We moved on to Italy, where two wines stood out for me. 2006 Rosso di Montalcino from Val Di Suga - a producer I'd never tasted before - showed like a baby Brunello, still tannic, nicely integrated fruit, earth, wood, acid and spice, not heavy, with character - my kind of Rosso that at ~25/bottle is well worth it. And Ceretto 2005 Zonchera Barolo - the basic Barolo from Ceretto - lustrous translucent ruby color, young and tannic, but showing pure, bright, primary sweet fruit, delicious and consistent with other 2005 Barolos I've had recently - quite a charming vintage. Ceretto is perhaps better known for their high-end Bricco Rocche label. Having had no experience with this producer, the first one was promising. Not inexpensive in 2005 (suggested retail $49, should probably sell for closer to $40), the 2004 can be found for $29. Note to self: this producer has a large portfolio of properties and single-vineyard bottlings that I need to research and taste more. 3 hours later, well past the customary lunch time, we bid thanks and farewell to Lori and were on our way to Bottega, a restaurant she reminded us of in Yountville that we'd never been to. Sitting outside on a perfect afternoon, sharing tasting notes, a sort of Italy-meets-Spain-meets-Napa-Valley food was spectacular. Krishna, never to be caught without a killer Burgundy in his trunk, produced a bottle of 2002 Chassagne-Montrachet Vieilles Vignes Rouge (old vines red) by Bernard Morey that hit the spot - bright, fresh, tart, light-to-medium body, with intense red berry flavor, it reminded me of another Chassagne-Montrachet rouge - a 1990 Leroy - a killer wine, both from excellent vintages. Chassagne-Montrachet is all about the whites, so drinking a red from that village is unusual. But I must say - these wines have it - a certain irresistible tart cran/cherry profile, purity, energy and silkiness of texture. Though normally I prefer Italian wine with Italian food, the wine's refreshing tartness was perfect on a warm sunny afternoon. A great meal and an awesome bottle of Pinot behind us, and a quick coffee pit-stop at Bouchon bakery, where one can buy the most delicious ridiculously expensive sweets in the Napa Valley (and to-die-for sandwiches), Krishna was on his way back, while Rona and I hit our customary shopping spot - Napa Premium Outlets. Normally a shoppo-hater, I have grown to embrace the Napa Outlets - where we easily spend 2-3 hours, stocking up on shoes, shirts, jeans, and god knows what. Before we knew it, it was 7pm and time to head home. The hour-and-a-half drive back was just long enough to allow both of us to contemplate the day's pleasures and to think fondly of the time we hit the Napa route again. I partnered with Megan Schuster, the owner of TorreBarolo, to offer an exclusive discount to readers of the Iron Chevsky blog, for a stay in the amazing Langhe Valley, where the king of Italian wines - Barolo - is made! 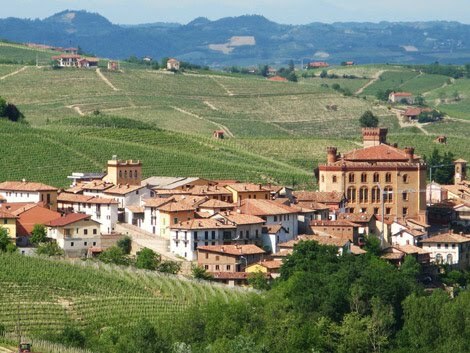 This is an excellent jump-off point for exploring Piedmonte, visiting world-revered wineries that I mention so often on these pages. The property consists of the top three floors of a five story tower with the entrance inside a cobbled gated courtyard. True to being a tower, there are 6 short flights of stairs inside the property, though none are overly steep. Here is the rub! -- mention to Megan that you are an Iron Chevsky reader, and not only will you get smiles, hugs, and warm reception, but you will get a 15% off in March and April, and 5% off the rest of the year. 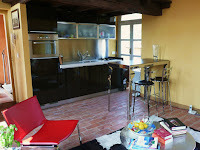 They have lots of positive reviews on TripAdvisor, on their own site, and on their facebook fan page. 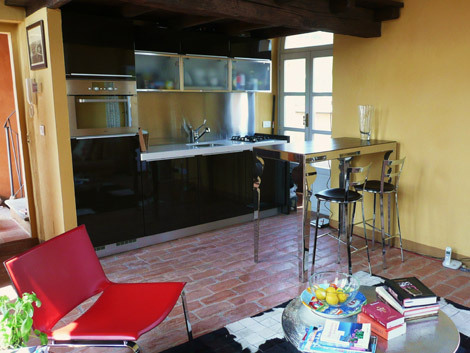 TorreBarolo is not a hotel, house, villa or cottage but a private apartment that offers a luxury self catering accommodation for two adults on a rental agreement for your holidays / vacations / gateway. 1st floor - Guestroom: The guestroom consists of 2 twin beds that can be put together on request. The bedding is 100% cotton with down duvets of varied weights. Each bed has 2 pillows, 1 firm and 1 down. There is a small ensuite bathroom with shower, sink, bidet and toilet. Towels and a hairdryer are provided though please bring your own toiletries. 2nd floor - Living area: Open plan living/dining/kitchen area with six floor-to-ceiling French doors providing stunning views of the environs. There is a side terrace off this floor, where a table and 2 benches enable you to enjoy al fresco cocktails and meals. Half a flight of stairs up from the living area, there is a mezzanine, where there is a 42' flat screen TV to watch a small library of DVDs, a desk and chair where you can use your laptop as the property offers broadband internet access (ADSL) and an all-in-one desktop printer. 3rd floor - Roof terrace: This is the most breathtaking feature of the tower. 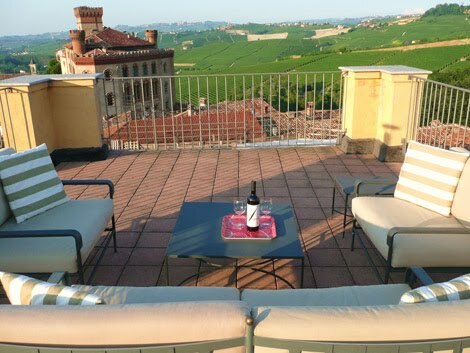 During your stay you will have exclusive use of the roof terrace that consists of comfortable outdoor furniture and an umbrella to shield the sun on warm summer days. 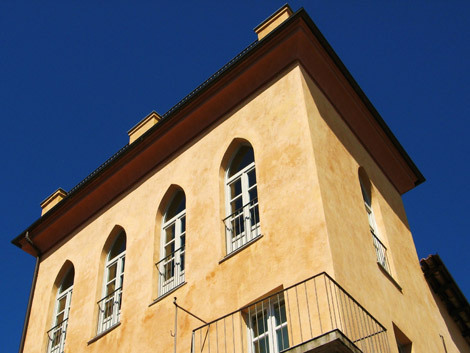 Style: Although the tower was refurbished with an eye to maintaining many of its historic features (ie, terra cotta floors, stone steps, arched window), many of the fittings and furniture are contemporary in design, thus providing something more stylized than some of the local B&B's and agriturismo. Note: I get absolutely no kickback for this promotion. I am doing it to benefit my readers, passing 100% of the savings to you! Where would I invite mama Chevsky for Mother's Day? My favorite restaurant of course! And to think that in all this time and in so many blog posts, she still had not been to Donato Enoteca! Well, good things are worth the wait. And although she doesn't understand all my wine jargon on the blog, she sure does love the mouth-watering photos. So on the lazy Sunday afternoon, Rona and I met my mom Diana and step-dad Fima for a late lunch and didn't leave until it was early dinner, 3 hours spent in a gastronomic "spa" - that's the effect this place has on me - no matter how tired and busy I am walking in, I always leave relaxed, rejuvenated, and happy. Mama Chevsky is as picky as they come. For those who remember the restaurant scene from "When Harry met Sally", Sally got nothing on my ma. But of course, accompanied by Iron Chevsky's wine picks, the meal was superb as always - piece of cake for Chef Donato, even on this busiest Sunday of the year. A few sips of the wine and a few bites of the food, mama bought in, let the guard down, and had one hell of a time over a great meal. Mom had mentioned that she particularly wanted to taste Donato's much-acclaimed thin-crust pizza. So I brought a bottle of 2007 Il Poggione Rosso di Montalcino that I thought should be great with pizza but would also scale to the rest of the meal, which it did. This was the second time in the past month I had this Rosso, with mixed reactions. The first time at Renee and Andy's wedding, this wine followed Produttori del Barbaresco 2005 basic Barbaresco. The Barbaresco was so much juicier, brighter, and tastier that the Rosso came off as simply dull. My thinking was that Rosso di Montalcino would be a "baby Brunello" and have the oomph to follow a lighter-bodied Barbaresco. Baby Brunello this was not. But true to my preachings of giving a wine a second chance, and out respect for Il Poggione, whose 2004 Brunello I like very much, I decided to try the wine again for Mother's Day. The meal finally made its way to my favorite chocolate dessert that I ordered specifically for the next two wines I'd brought. The dessert had to be chocolate, because of the two bottles of Malaga fortified sweet wine produced by Tierras de Mollina from Pedro Ximenez grape, with a small amount (under 15%) of Moscatel blended in, using a solera system. One wine - Carpe Diem Añejo - was aged for average of 8 years. The other - Carpe Diem Trasañejo - was aged in a much more extensive solera that had begun in 1809 resulting in a wine of approximate average age of 25 (i.e. there are traces of wine from 1809 in those barrels!) The wines are not sold in the US and were shipped to me directly from Spain after I zeroed in on the Añejo at the Spanish Cellar & Pantry tasting earlier this year. At that time, I had mentioned to the producer that I thought this sort of wine would gain complexity with extended aging, and as it turned out they did carry (though not at the tasting) a much longer-aged version. The producer helped answer the question by sending me samples of both. I have to say - I was absolutely, unequivocally right. The 25 year old Trasañejo was outstanding - the best Pedro Ximenez sweet wine I'd ever tried - deep nutty orange caramel, excellent acidity, relatively low alcohol for a fortified wine (15%) with no perceptible heat, and small amount of old box woodiness reminiscent of an old Port. The more I kept sipping, the more I liked it. Despite the thick texture and high sugar content, it was not syrupy, was easy to drink and was simply heavenly with the chocolate soufflé (shown below). So much so that I am trying to convince Eric the wine director of Donato Enoteca to figure out a way to add it to his venerable list. What a finish to a great meal! And so on this Mother's Day, mission was accomplished, mama Chevsky was happy and a little tipsy, and the mishpucha around her breathed a sigh of relief! With a little heaviness in our stride, we stumbled out of the restaurant, 5pm still early enough to perhaps sneak a mid-night snack before turning the lights off on the sweet weekend. The other day I had dinner with Mariacristina Oddero - the owner of the Oddero winery, one of the top producers of Barolo, well respected for their dependable quality, and notable for being run by a female in traditionally a male-dominated business. Mariacristina took over from her father Giacomo Oddero in the mid 1990's, making subtle improvements upon his methods, and according to her, coaxing more complexity from the grapes. Now at 82, Giacomo cannot deny her success, but back then he was not at all supportive. They've been making wine for 6 generations. The first ever Oddero Barolo was bottled in 1878. A traditionalist, maintaining age-old techniques as exemplified in the modest use of oak (big Slavonian oak barrels) and long maceration times, combined with modern-day equipment and cleanliness, Oddero's perfume and fruit manage to shine through strong tannic structure at a relatively young age (5 years+). At the dinner hosted at Donato Enoteca, we sampled an array in the most perfect setting imaginable, with great food and good company, without being overwhelmed by multitude of wines or time pressure and fatigue of a trade tasting. A flawless custom-crafted Piedmontese 6-course meal by Donato accompanied 6 wines - a Chardonnay/Riesling blend Langhe Bianco Collaretto 2008, Barbera d'Asti Vinchio 2006, basic Barolo 2005, single-vineyard Barolo Rocche di Castiglione 2005, single-vineyard Barolo Bussia Soprana Vigna Mondoca 2004, finishing off with Moscato d'Asti Cascina Fiori 2008. After the official meal was over, Eric the wine director pulled out Barbaresco Gallina 2005 and Oddero Villero 2005. Under the spell of food and company, the wines served at perfect temperature in perfect glassware to a crowd in damn good mood showed very well indeed, reaffirming the appeal of the 2005 vintage (see my notes from Tre Bicchieri tasting earlier this year). The lowly Barbera and Moscato d'Asti were very very good too. As for the Barolos, the wines were solid. The basic 2005 had a fascinating hint of salami on the nose - on special that night for $34 (6-pack pricing), I thought it was the best value. The Rocche was promising, but quite tannic at this point. The Bussia Soprana Vigna Mondoca was a year older (2004), more intense, more open and dark-fruity, while the impressively deep-flavored Villero displayed hints of coffee. I was told that the 2000 Vigna Rionda available for sale ($110) was amazing - supposedly a significant step up from the mid-tier and worth the high price tag, but alas it was not tasted that night. The next day as I attended the Wine Warehouse trade event in San Francisco's Fort Mason focusing on the new (2006) releases of Barolos, I ran into Mariacristina again. This time I drank her array of 2006's - the basic Barolo, then Rocche di Castiglione, and finally the Villero. I also re-tasted the 2004 Vigna Mondoca. Oddero's 2006's were noticeably more open and less bitter-tannic than all other 2006 Barolos I'd tasted all year, including those from Parusso, Canterno Fantino, Einaudi, and Marcarini. Across the board they have been tough for me to judge due to incredible, hard-as-nails, gum-drying tannins in these young Nebbiolos, although talking to a number of experienced tasters and winemakers themselves, the message has been that 2006 is significantly better vintage than 2005 and more classic than 2004 (2004 shows more fruit while 2006 has more acid, earth, spice and tannin for even longer development). Considering how good the 2004 was, it's a bold statement for 2006, but at this point I will just have to take their word for it - I could not tell, and will stay away from 2006's for at least another year until they mellow out somewhat. Interestingly, the 2004 Vigna Mondoca was not as tasty as the day before. Blame it on the setting, on palate fatigue, on the bottle temperature, or lack of decanting, or the glassware.... whatever the reason, this was a telling lesson of how one should be circumspect of the hurried trade tasting impressions. Be mindful of the circumstances in which critics' scores are given, remember how important the context and setting in which are you consuming wine is, and don't jump to conclusions too quickly. Chinese rice wine, of which Shaoxing is the most famous variety, is in the top 10 most important ingredients in Chinese cooking, some claim it's second only to soy sauce. According to wikipedia, over 5 million Chinese live in the US and Canada. Yet there are not many places in North America, physical or online, where one can buy quality Shaoxing wine. Unless you live in a city with a large Chinatown or a Chinese supermarket like Ranch 99, you are out of luck. All the better for ChineseRiceWine.com, an Oregon-based online business that aims to popularize Shaoxing rice wine in the United States. Given my interest in the subject, the founder Scott Thurman, an American ex-Intel business development manager turned into Shaoxing rice wine guru, sent me a sample of his portfolio of three rice wines - a 5, 8, and 10 year aged, manufactured by Shaoxing Dayue Wine Co. Ltd of China. A hi-techy turned a wino is a kindred soul, so I promised Scott to put his babies through their paces and publish my report. Relative to the cheaper stuff sold at various asian markets that I reviewed previously, these are quite premium - $20, $30, and $40 respectively, and they come in beautiful jars. Last week, Rona and I visited her parents in Vancouver, which provided a perfect setting for a 4th installment of my Shaoxing wine series. I love Chinese food in the Bay Area, LA (Monterey Park), New York (Chinatown), but in my experience, outside of China, Vancouver is the world capital of Chinese cuisine. Shanghainese food I know in the Bay Area (with the exception of the famous soup-oozing Xiaolongbao dumpling) is quite heavy, with lots of brown sauce that should in theory match Shaoxing wine. However, this particular restaurant served modified, more healthy Shanghainese - primarily seafood. As the restaurant was fairly new, they had not gotten an alcohol license yet. So we snuck the wines in and drank out of tea cups - color-wise they were indistinguishable from black tea - while keeping the bottles on a chair under the table. I felt naughty! Would these dishes match Shaoxing wine? Champagne - yes, Riesling? - oh yes! But Shaoxing? Determined to proceed with my study, I pushed on. The least expensive of the bunch - Poet's Inspiration, named after Lu You, a 12-th century warrior poet born in Shaoxing - a 5 year aged wine was eye-opening and my all-time favorite among any Shaoxing wines I'd ever tried. It was light, subtle and elegant, and the best match for the food. The night before, we had it with Maya's (mom-in-law's) amazing 5-spice pork shoulder (shown below), and the 5-spice + pork + wine definitely worked! The two more expensive wines - Emperor's Own 8 and 10, were darker in color, thicker in texture, and stronger in taste, and perhaps suited a Chinese palate better, but not mine. Although Baya was initially taken aback by the unfamiliar lightness of the Poet's Inspiration, he eventually appreciated it. His favorite though was the 10 year aged. Though these wines are traditionally drunk warm, out of the scientific rigor we tried them cold as well - predictably they tasted better warm, except with spicy dishes where the heat of the wine exaggerated the heat in the food. Because of the spice, the wine and the amazing Kung Pao chicken (according to the owner, the chicken is softened by sitting in baking powder for 2 hours before cooking) didn't match. Only the crab fried in light batter and dipped into sweet and salty sticky oyster sauce, seemed to be a match in the right direction but still not quite getting there. I imagine heavier meat dishes, non-spicy, especially those cooked with Shaoxing wine would have been best. Alas, they were not served! Our family reunion was all-the-better, more focused and more relaxed by the fascinating Shaoxing wine. And although we did not find the world's greatest food & Shaoxing wine match, we were so happy to try! Until next time, my search goes on.